As you think about how to transform your living space, see how your wood furniture can be more versatile. Does a bookshelf have to be used for books or can it become a unique bar? Does a coffee table have to be in centre of your living room? Must you have chairs that match or can you make a statement with individual, bold pieces that become a topic of conversation? Modern day home décor can be so exciting and a lot of fun with a little creativity and panache. Visit Carrocel’s fine furniture store to start building a collection and give your home a makeover as often as you want. High-quality wood furniture stands beautifully on its own but also works long-term to create your home’s sense of style and personality. The most important thing to remember as you design your living room is that “versatile” does not mean basic or boring. In fact, some of the most ornate pieces can become the most versatile components of your living room. Stools – Stools are multi-functional, stylish and the perfect component for your living space. They serve as accent tables, foot rests, an extra seat and even a cozy nook to hide blankets. Chairs – A pair of chairs can continue to grow with your décor. Opt for living room chairs that match and accent with pillows and throws. A neutral chair colour can adapt to new trends over the years, but a bold colour can make waves today—choose what best reflects your personality. Remember that chairs can be reupholstered and refinished to match future décor tastes, so pick your style to match the look you want. Display Cabinets – A distinguished style adds charm to your furniture collection. Bookshelves and display cabinets bring character to your space, giving you the opportunity to show off your curios and travel treasures. Chest of Drawers – The sheer versatility of this piece of wood furniture is beyond compare. Small, tall and wide chests of drawers can be used for more than just clothes. Find a piece that can serve as a buffet in your modern dining room, an entryway organizer, an attractive bedside table, even as a space to put your music collection in the living room. 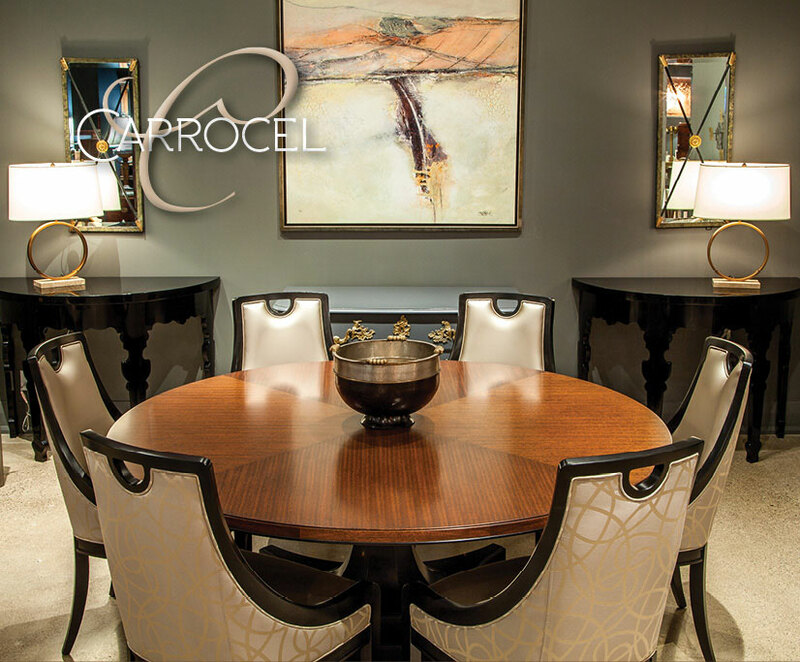 From classic to obscure, Carrocel features the finest furniture created for your exclusive home. We carry a large selection of versatile pieces and our extensive inventory lets you have fun, be creative and most importantly, establish your space just the way you want it.